This is a 6 month art course for beginners which contains 6 distinctly separate courses for beginners (to enable a HUGE cost savings of $214). ~ 10 - 20 Video lessons per module - almost 60 HOURS OF real time instruction!! Students who register for this 6 month course better prepare themselves for quite a ride!!! We start off with an introduction to Drawing and Dry Media in the first module known as Drawing Daze. Learn the basics of mark making, blending, proportions, perspective and the tools that make it all happen. We also discuss whimsy vs. realistic styles and figuring out, which one are you? Each week brings practice by learning to draw first simple shapes and objects, then moving on to flowers and the female face with some zentangling fun thrown in for good measure! My good friend and AMAZING artist Claudia Finelle will be guest teaching in this module. She is best know for her Manga drawings, I can't wait to see what she has in store for you! Here is just a sampling of what we will be working on! Next we will be honing our drawing skills by practicing with markers and watersoluble mark making materials (say that 3 times fast!) in Module 2, Magic Mark Makers. From fancy copics to the mighty watersoluble Tombow and Stabilo, the illustrative possibilities of the these simple tools are endless! Again we will be practicing by rendering florals, fun animals and (of course) fun faces! 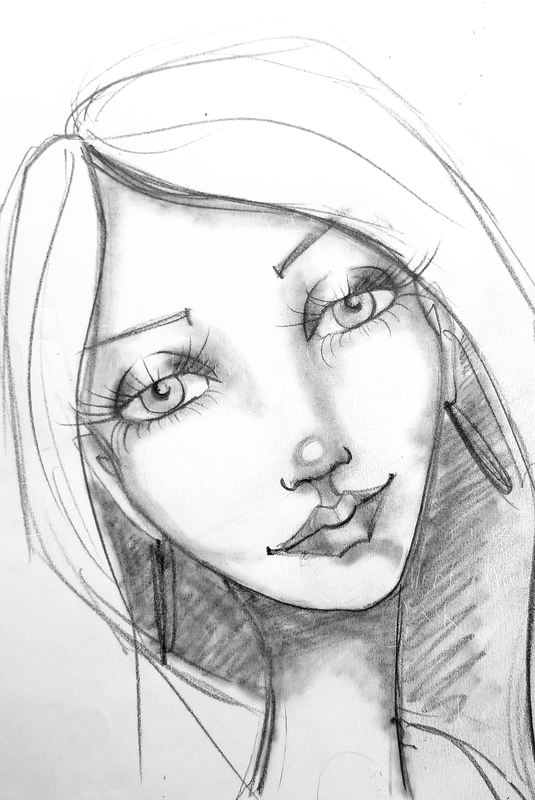 Australian artist, Kylie Fowler, will be guest teaching and showing us her favorite drawing tools, stay tuned! For a full description and peak at ALL of the projects we will be doing, please refer to the individual course description for Module 2, here is just a small sample!! So much! I know!! Then I will introduce you the wonderful world of acrylic painting (Awesome Acrylics, Module 3) and the magic of all the tools and mediums that come with it (horray!). We will begin to incorporate some new fun into our art drawings with gloppy, sloppy, drippy, slippery, vibrant inks and paint. Again we will be painting everything from simple florals, animals, abstracts and vases in addition to the more complicated whimsical face. Muriel Stegers will be joining this class from the Netherlands to share her favorite acrylic mixing medium...don't miss it!!! Here's just a taste of our projects! After all that I will bring watercolors to the table (Module 4, Wondrous Watercolors). This can be an uncomfortable medium for lots at first what with it's unpredictability and spontaneous move-ability but with the right tools, a wide knowledge base and a little bit of confidence, you'll be splashing that color around in no time!!! Florals take center stage in this course with a face final and some whimsical colored zentagles as well, so fun! Watercolorist Brandi Dayton will be making an appearance this month to show us her favorite watercolor techniques. Her work is GORGEOUS, I can't wait to see what she brings to the table!! I definitely do NOT have enough space for the crazy number of projects in this jam packed module but here's a small sampling! To see them all, just pop over the individual module description and have a look! Buckle your seat belts as next as we will be going for a wild ride into the world of wax and blow torches in Module 5, Enthralling Encaustics. You heard me! Bust out your crock pots because in this class I will teach you all about how encaustic works. How to set up a safe studio environment and all the essential tools and supplies to get you up and running in a day! In addition to creating some abstracts and landscapes we will be applying our watercolor skills here as well. How? You ask? Enroll to find out! I am completely over the moon that artist Ivy Newport has offered to come share her love and experience with us all in this months module. She is super talented and experienced, you do not want to miss this! There's just too many project to highlight in such a short amount of space but here's a couple to wet your appetite for this exciting medium! Each of these previous modules ultimately culminate in the mac daddy of all fun art practices which we get to next in: mixed media!!! Woohoo! After I lead you through the steps to make your own fantastical altered journal (yeeee!) we will embark up on the crazy awesomeness of some of the most fun and popular mixed media techniques you can get messy with. We will, quite literally, be mixing up ALL our media and ALL of the techniques we have used thus far and mash them together in this fantastic finale of a class (along with some uber awesome new tools we won't even have gotten to yet!!). And yes, we WILL be doing a face in this module as well, sooooo awesome I promise you!! Petra Stein will be bringing her mixed media madness to our lesson this month. She has taught her own mega mixed media class so I KNOW she knows all about many super cool techniques and I can't wait to see what she has in store to share! Support for all classes can be found in my private Facebook Group as well as via email and within the classroom.